Abadeh rugs are named after the village where they are made which lies about 200 kilometres south of Isfahan on the road to Shiraz. The designs of these rugs have been drawn from sources such as Caucasian, Qashqai weavings, this is no doubt from the annual visits of the tribes which camp near the village during the summer. There are two types of Abadeh, although there are multiple different designs. The first is a design in which the diamond shaped field has placed within it a central medallion with other medallions being placed (more often than not), at the corners outside the diamond. 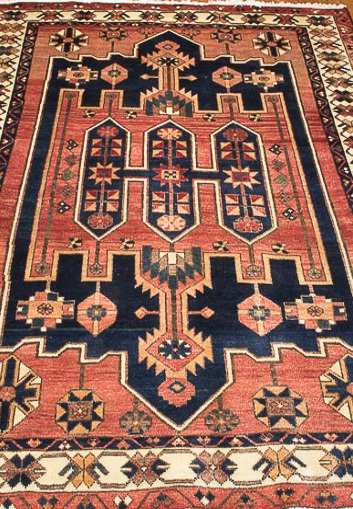 The diamond shape may be the result of Qashqai influence, for it is the main decoration of the tribe's rugs. The remainder of the design is composed of small geometric motifs, flower and leaf patters, recalling those used the the Fars. The second common design is the so called zee-i-sultan motif. The design, which is usually comprised of vases of flowers arranged one above the other, covers the entire field. Abadeh rugs are noted for their use of this design. The design is also found on Qum and Vermin rugs. In relation to the field the borders of the rugs are small, being normally composed of two guards, one on either side of the central band, which is of a different ground to the guards. Colours are usually harmonious and pleasing and feature flame red, blue, brown, terracotta, and occasionally green. Afshar is the name of a nomadic tribe which inhabits the tableland to the south of Kerman near Shiraz. Today the name of Afshar is also given to rugs made in the villages in the area. Though originally pure nomadic in inspiration, Afshar rugs share both nomadic and village features, both in their decoration and technical specification. The tribe originally came from Azerbaijan, between the Tigris and Euphrates, but after a dispute with the Turkish sultan, left their homeland for their present location. This happened in the late 16th century. Afshar rugs are made both on the horizontal loom of the nomads and the vertical loom of the villages. Originally the warp and weft were of wool, but today it can be entirely of cotton or a wool weft with cotton warp. Designs are varied and in addition to Afshar designs include motifs from the repertoire of both the Kerman craftsmen and the Fars tribe. Colours too are varied; cream and white being a distinctive feature - the most common grounds are blue or red. The motifs can be divided into geometric and floral. 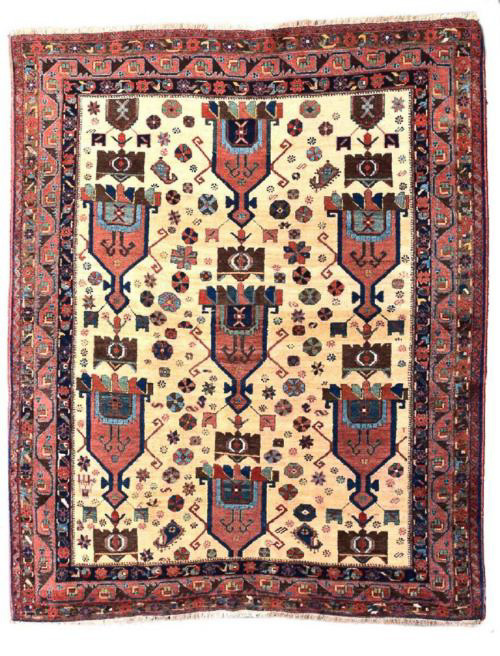 Of the geometric designs, the most typical Afshar motif is the so called morgi or chicken design. In this the entire field is covered with what appears to be a repeated geometric chicken design. Another is covered with what appears to be a repeated geometric chicken design. Another design derived from Shiraz is the large diamond motif, either two or three. The field is tightly covered with smaller motifs, sometimes depicting Kerman floral influence. The rugs of the nomadic Bakhtiari tribes are made in a region which extends south of Isfahan towards the Persian Gulf. To the north the area is bordered by the Zaindeh River, while on the south and west it is flanked by the Zagros Mountains. The carpets and rugs of the Bakhtiari are distinctive and easily recognisable by their special designs. The field of the rugs is nearly always divided into squares or diamonds or similar shaped sections, each of which contains floral and/or flowering plant motifs and occasionally animals. The design may be repeated in each section or changed using a number of motifs. Although originally nomadic in inspiration, today many of the nomads have settled in villages and have absorbed Persian designs and techniques. 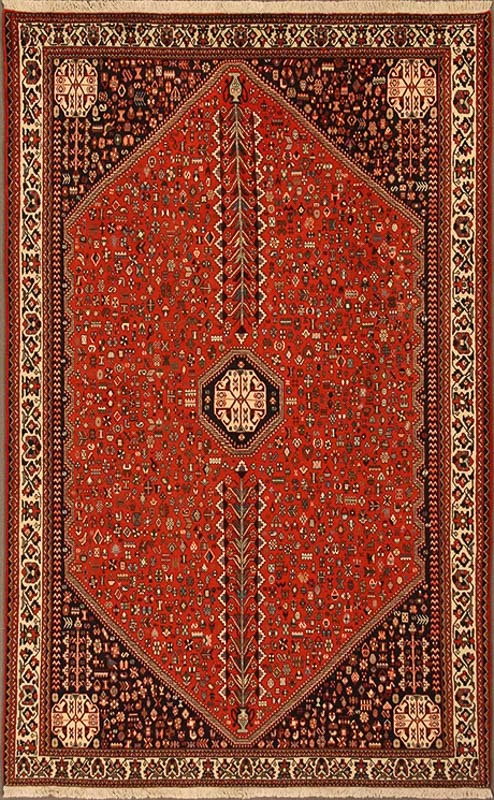 Thus Bakhtiari rugs and carpets can be found with both Turkish and Persian knots. They also can be made on vertical and horizontal looms. Some Bakhtiari tribespeople, who have forsaken the nomadic life in favour of more settled conditions, have turned to rug-making for a living. Their rugs, from the village of Shahr Lord show strong traditional Persian influence in contrast to their nomadic tradition. Here the the herati border is popular. More traditional borders utilise the serrated leaf pattern. Colours are generally dark; red, green, brown, with highlights in yellow ochre and vivid blue. The city of Hamadan, perhaps the most important centre of rug-making in Persia, is situated in the north-west of the Persian plateau. The term Hamadan, however, is applied to rugs from a wide area around the town. Hamadan was once the capital of Persia during the period of the Seljuks and is today the catchment centre for rugs from numerous towns and villages, many of which have been weaving rugs for centuries. Because Hamadan rugs are drawn from such a wide area, they can be extremely varied in design. They are very hard wearing and generally of good quality. Rugs are also made in the town. The Hamadan group also includes Lilihan, Mahal, Mazlaghan and Mushkabad rugs. Of the main area near the town the best rugs come from the village of Khamseh to the north of the town and Borchelu to the east. Apart from the village rugs, Hamadan also encompasses some nomad work that is brought into the town for sale. The term Mosul is sometimes applied to rugs of the Hamadan group. Khamseh rugs are normally distinguished by the central medallion of geometric form. The corners are decorated with a similar design to the central medallion and the border, normally three banded, displays high stylised motifs. 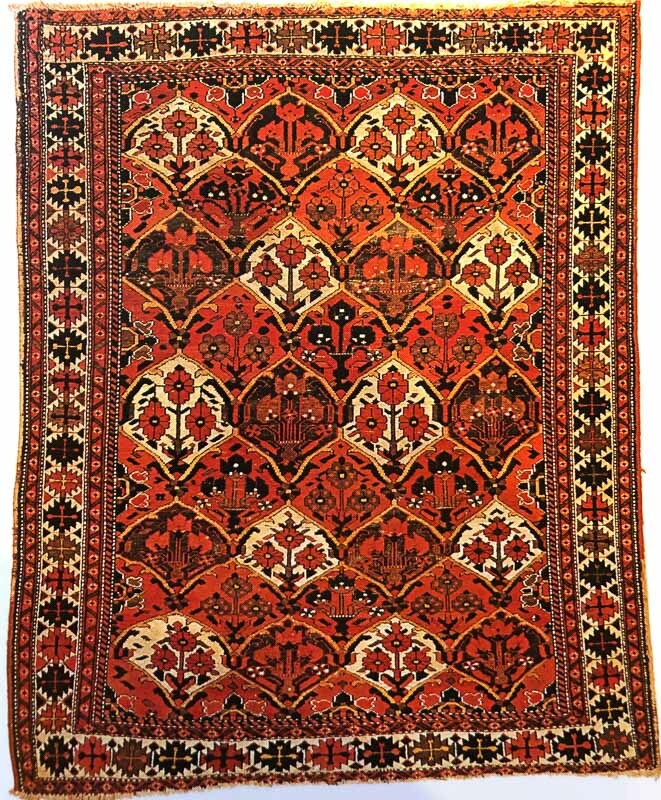 The heart design is perhaps the most common motif used on the rugs from Borchelu. A red background is favoured. Sometimes a floral or geometric medallion on an ivory background is found. As with Khamseh rugs, the design of the central medallion is repeated at the corers. The central border repeats the main design, while the two flanking guards tend to display a continuous rosette design. Kashans are made in the town of Kashan and its surrounding villages. Situated about 150 miles south of Tehran, it is one of the hottest areas of Persia, being just on the edge of the Salt Desert. Water is very scarce. There have been carpets and rugs made in Kashan at least as far back as the 16th century. Production, however, has not been continuous, for as with the case of Isfahan, it was interrupted by the invasion of Persia in 1722 by the Afghans. Rug making in any quantity was not re-established until the turn of the century though a few rugs were made from about 1870. Rug making as a small scale industry was brought about by textile merchants, who turned to the rug trade after their own trade had been hit by imported merchandise. Kashan quality is noticeable at once. 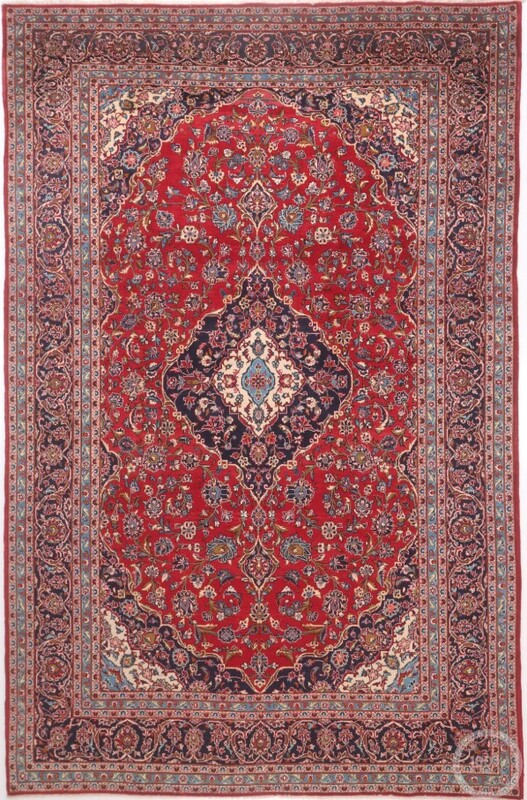 The wool of the early carpets (Kashan Motashemi) is especially good, which gives a smooth velvety quality. It is said that the wool was imported from Australia. 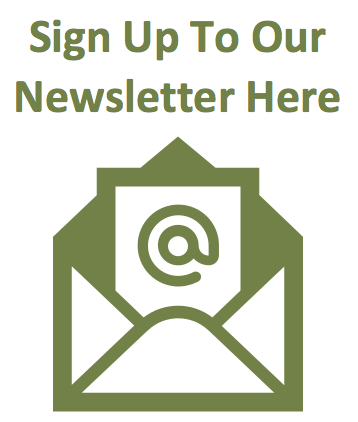 Kashans are highly treasured and classed among the very best Persian carpets and rugs. They are easily recognisable by their distinctive design. The field is covered with floral motifs and they almost invariably have a central medallion. At each end these medallions branch into coronet-like flowering tendrils. In each corner is a motif resembling the central medallion. Kashans are made without the central medallion by they are not common. Floral decoration, however, is almost invariably the rule and occasionally elaborated with the addition of animal motifs. The border is always herati and usually surrounded by up to four guards of rosettes etc. Red and dark blue are common colours, usually in tandem contrasting with each other.